Earlier this week, I blogged about a Spicy Basil-Mint Pesto Sauce we made and my fondness for recipes that use simple, readily available ingredients which can be recreated into other dishes out of leftovers. So last Wednesday I made a pesto sauce that we used for a hearty dinner of Pesto Marinara on Whole Wheat Linguine. 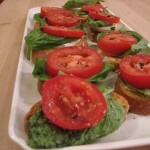 The next day, I used some of the leftover pesto to make this bruschetta style appetizer. Also makes for a great snack! Stay tuned for the healthy breakfast that I made using my last bits of pesto. For the Spicy Basil-Mint Pesto recipe click here. Making Pesto Bruschetta: This is an easy appetizer to make for a dinner party because you can make the pesto a day in advance and store it in the refrigerator. It’s also a really colorful addition to a dinner table (and while I love food to taste good, looking pretty is nice too). When you’re ready to serve, arrange the bread slices on a cookie tray. Smear a little Olivio or butter on one side of each piece of bread. Sprinkle the garlic pieces over the bread so each bread piece has one or two pieces of garlic. 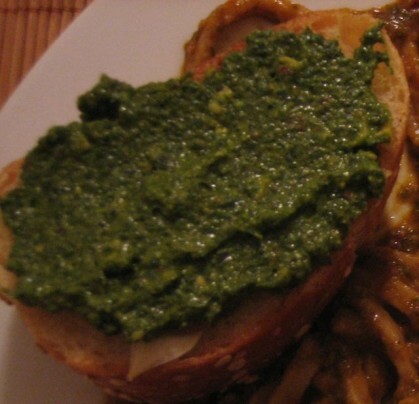 Spread a generous layer of pesto over each slice of bread. Pop the tray into the oven at about 350 degrees or into a toaster oven for about 4-5 minutes or until the bread starts to look a little golden around the edges. Eat while still toasty. Serve this alone as an appetizer or alongside pasta. We had ours with leftover Pesto Marinara on Whole Wheat Linguine (happy to report that it made for great leftovers). You might also like this quick Bruschetta with Ricotta Salata. Mmmm….I adore mint pesto. I spread it on pita and broil for a few minutes, then top with arugula and white beans tossed with lemon juice. A quick and tasty lunch!